Among the dormant houses – and there are plenty – Universal Genève SA’s state of limbo is the most puzzling, for here is a brand whose time has surely come. 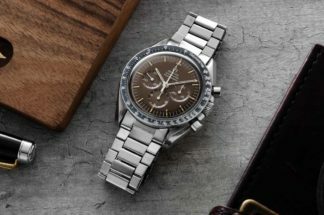 Pardon the use of that cliché, but its currency has skyrocketed since its recent rediscovery by an influential newbie, though seasoned collectors have always known it to be one of the most important of all the “tool” watchmakers, ranking alongside Minerva, Zenith, Breitling, Longines, Heuer and others of that level of fame or influence for chronograph development and production. Universal started out as a manufacture and even has a credible claim to being the first producer of a chronograph for the wrist, as far back as 1917. As it makes this the centenary year of that particular watch, there has never been a better time for Universal to rise from the ashes. Founded on 18 January 1894 as Universal Watch, the company was originally based in Le Locle, moving to Geneva in 1919. Just as car purists call Rolls-Royces “Royces”, the more pedantic of collectors call the watches “Universals” without the geographical subtext. 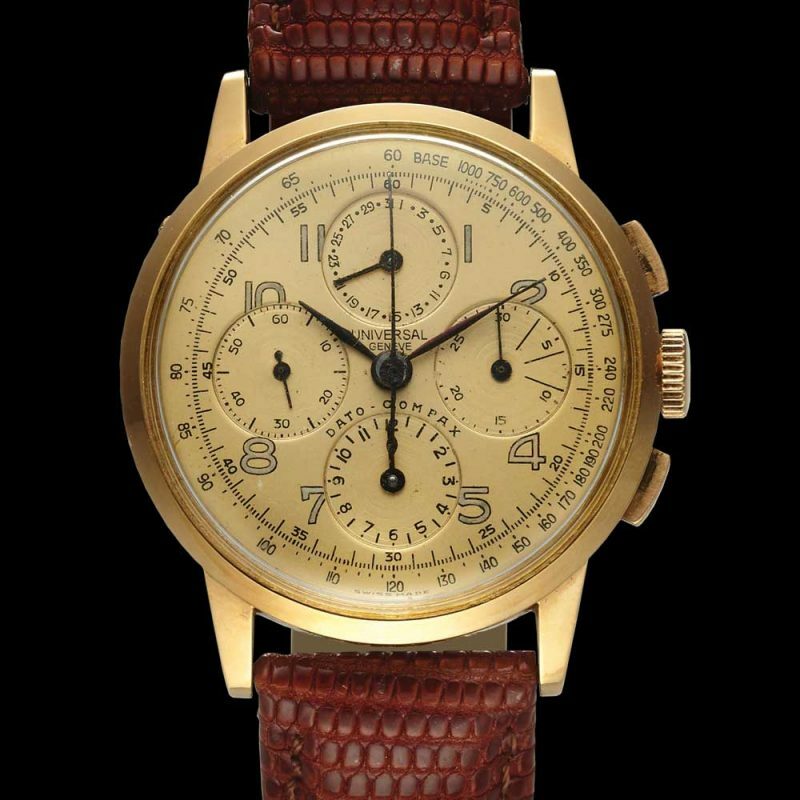 Their argument is simple: Just because the city name is on the dial, you don’t say “IWC Schaffhausen.” Be that as it may, the use of “Genève” enhanced the company’s credibility, for the location also included the likes of Patek Philippe, Rolex and Vacheron Constantin. Co-founder Ulysse Georges Perret, born in 1868, and friend Numa-Emile Descombes were student watchmakers in Le Locle. 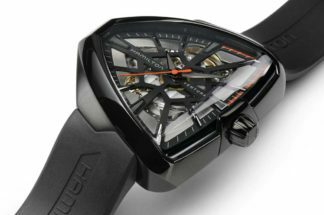 They began with the production of watches, as well as acting as retailers, swiftly upping their profile by patenting a watch with 24-hour indication via a jumping disc. Descombes died in 1897, aged just 34, so Perret sought Louis Edouard Berthoud as his new partner. Within the first year, Perret and Berthoud unveiled a chronograph equipped with a 30-minute counter. 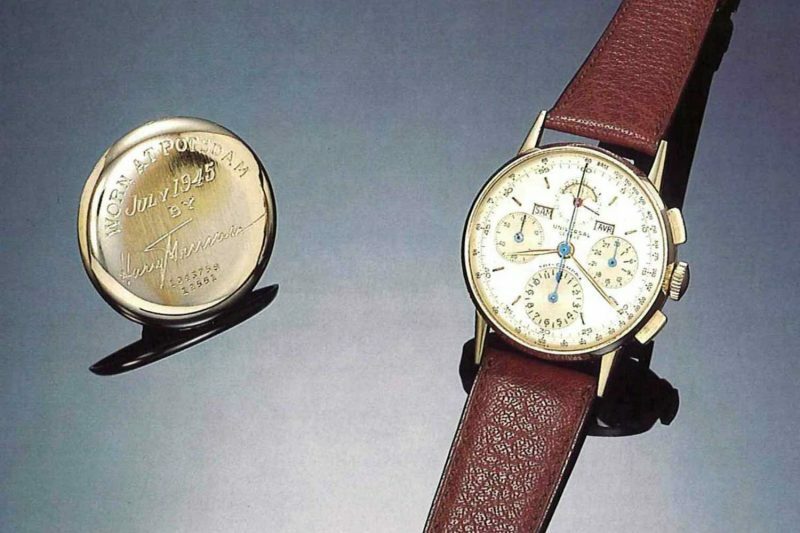 As for most brands, the Great War increased demand for watches. 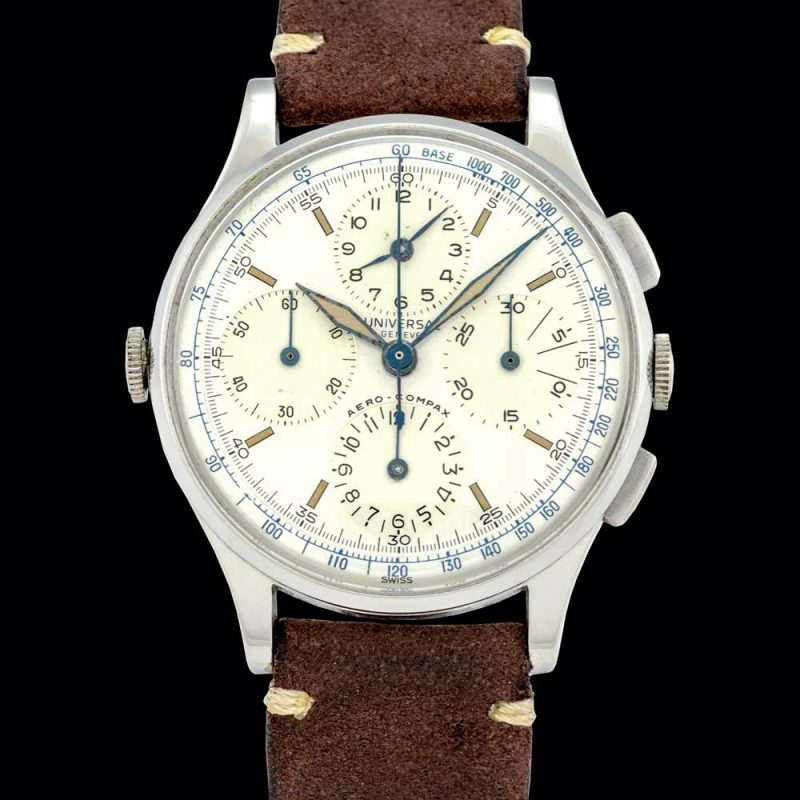 The pair produced timepieces for both sides – Swiss neutrality demanding this – and created the first wrist chronograph with counters for minutes and hours. Its status as the ur-chronograph is, however, open to debate, as pocket watch chronographs adapted for the wrist already existed. Semantics aside, this device certainly ranks with contemporary models from Longines and Breitling as among the first. By now a fully-fledged “Geneva brand”, the renamed company enjoyed sales success under the control of the founder’s son, Raoul Perret. 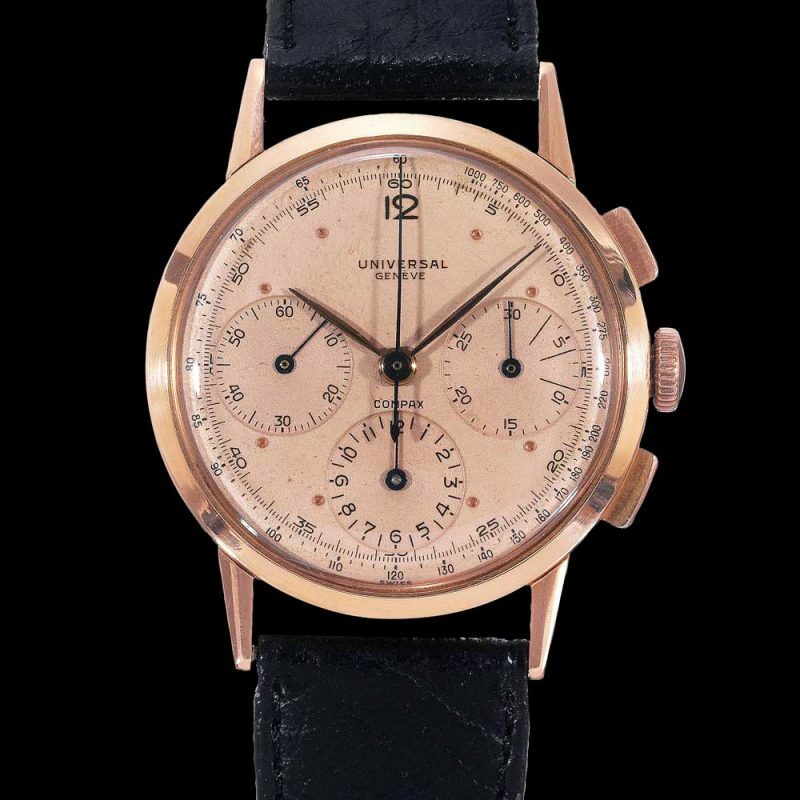 Chronographs were not the company’s sole output, and the catalogue included dress watches. By 1925, Universal had its own patented automatic, the Auto-Rem, a 15-jewel movement with buffer-style winding. This was followed by a basculante-type watch with flip-over case called the Cabriolet in 1929, and watches with 8-day power reserves. Clearly, Universal was no one-trick pony. 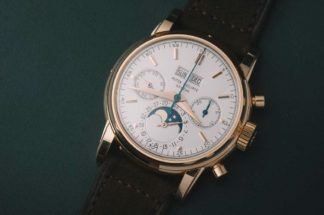 But while many of the company’s time-only models would attain high levels of desirability, especially the Polerouter (more of which anon), it was the fertile period up through the 1960s and chronographs that established Universal Genève’s status. Unlike the litany of nicknames applied to vintage Rolexes, the monikers associated with Universal Genève have – like “Hoover” or “Tannoy” – become generic terms for watch layouts. It was the company’s clarity with sub-dial arrangements that gave us names for both the positions of the sub-dials and the models themselves, primarily 3-6-9 sub-dials instead of the 6-9-12 of, say, the Valjoux 7750. The Compax, Aero-Compax and Tri-Compax, all dating back to the 1930s and 1940s established the patterns. Following Perret’s passing in 1933, his son would take over management, and the brand would remain a family-run business for the next 30 years. 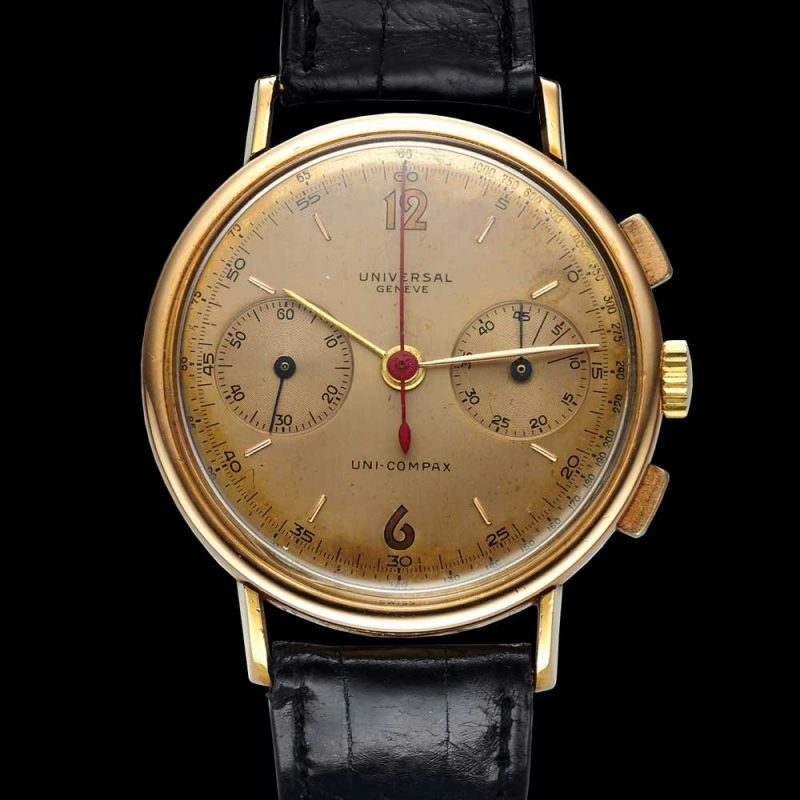 In 1934, Universal launched the Compur, a chronograph wristwatch with two pushers, with a trademark registered under patent no. 83340, believed to be the first movement fitted with two column-wheels. The first Compax arrived in 1935, with 12-hour and 30-minute counters, followed the next year by the Uni-Compax with 45-minute counter; the “Compur” name was replaced with “Compax” in 1936. In 1937, the year the company changed its name to, succinctly, Universal Genève, the maison launched the smallest ladies’ chronograph seen up to that point, with a 19 1/2’’’ movement. 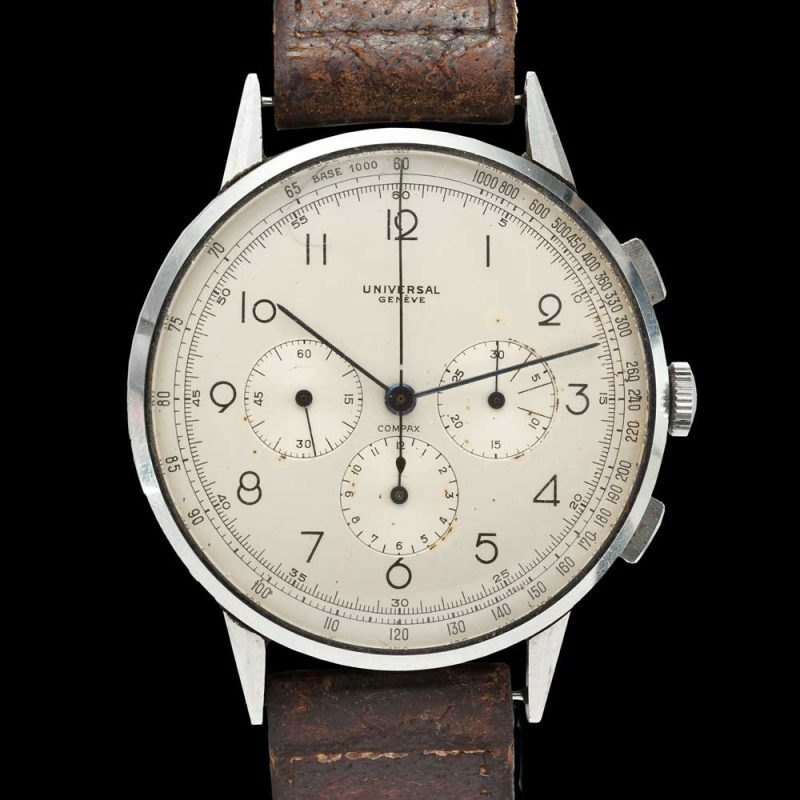 From this period came the watches that are now causing the occasional furore in auction. The golden age of Universal Genève got into its stride in 1940, with the launch of the Aero-Compax, with patent No. 235608. This featured a fourth sub-dial with independent hour and minute hands at 12 o’clock. More would follow throughout the war years. 1943 saw a calendar watch, with or without moonphase display, with small seconds at 9 o’clock, date at 3 o’clock, day at 12 o’clock and months and moonphase at 6 o’clock. The next year, Universal issued the Tri-Compax to celebrate its 50th anniversary, with hour-counter, triple-date calendar and moonphase. In 1945, the Compax range grew to include the Medico-Compax with an hour counter bearing a pulsometric scale, and the Dato-Compax with an hour counter and a fourth sub-dial at 12 o’clock, showing the date from 1 to 31. Beyond the chronographs, Universal also demonstrated innovation with time-only models. In 1948, it released the Calibre 138, a self-winding 12 1/2’’’ movement with small seconds and, later, centre seconds. It would appear in the earliest examples of the Polarouter (then with an “a”), designed by a young Gérald Genta, which arrived in 1954-5. Initially developed for Scandinavia’s SAS pilots, its name reflecting the first air route from Europe to the United States over the North Pole. The crew wore Polarouters, which were able to withstand the magnetic fields present at the Pole. When Universal replaced the Calibre 138 the following year with the innovative Calibre 215 micro-rotor movement, called the Microtor, the model changed from Polarouter to Polerouter. It would remain in production until 1969, with an array of handsome variants including the Polerouter de Luxe, Polerouter Jet, Polerouter Super, Polerouter Genève, Polerouter Compact, Polerouter “NS”, Polerouter III and the Polerouter Sub diver’s watch. 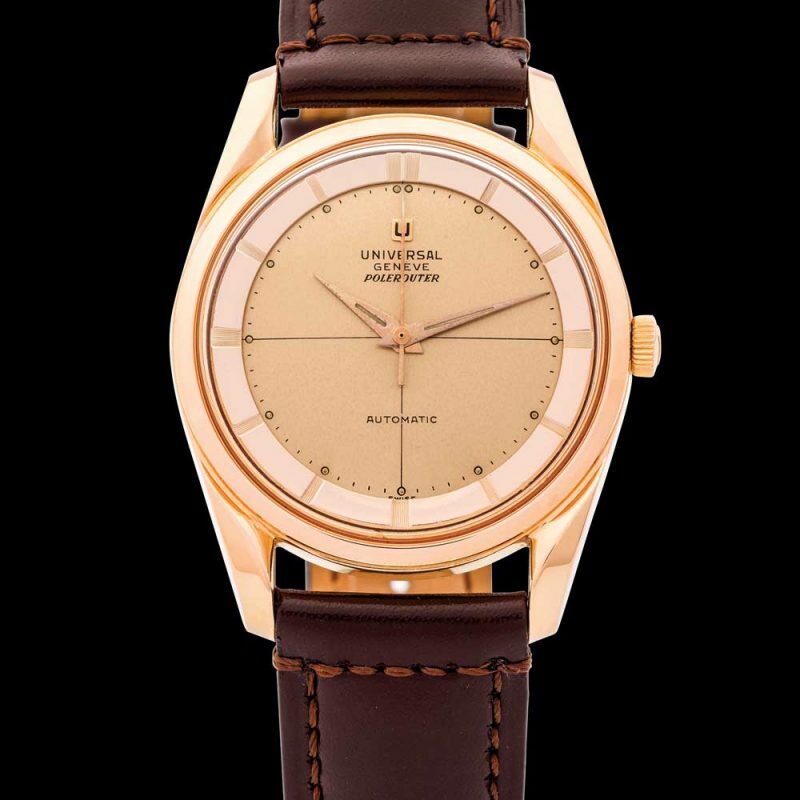 Genta would also design the most celebrated of Universal’s dress watches, the Golden Shadow in yellow gold and the stainless steel White Shadow, launched in the mid-1960s. Said to be “the world’s thinnest self-winding watch” with 2.5mm thick Calibre 66 and Calibre 67 (with date), it held the record until 1978. But not long after, as with the rest of the watch industry, the arrival of quartz changed Universal’s direction, and the company would continue with a mix of mechanical and quartz models. Along with the changes wrought by quartz were changes of ownership. Universal was owned by Bulova during the late-1960s and early-1970s, helping it to expand in Asia. Inevitably, it ended up in the hands of a company in the Far East, when purchased in 1989 by Hong Kong-based Stelux Holdings International, Ltd. Although there was a flurry of activity in the mid-Noughties, the brand seems, at present, to be inactive. 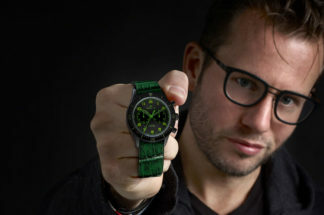 Unpaid ambassadors always beat company shills and one of the owners of Universals was 45th US President Donald Trump, who wore a Universal Genève before donating the timepiece to Antiquorum for charity in 1999. His “Senna Chronometer Officially Certified,” No. 41, ref. 198.310 sold for $6,000 plus premium. This limited edition, in production from 1997, was named after the late F1 driver, the proceeds endowing the anti-poverty charity, Instituto Ayrton Senna. Another US President, Harry S. Truman, famously sported his Tri-Compax at the Potsdam Conference in the summer of 1945. 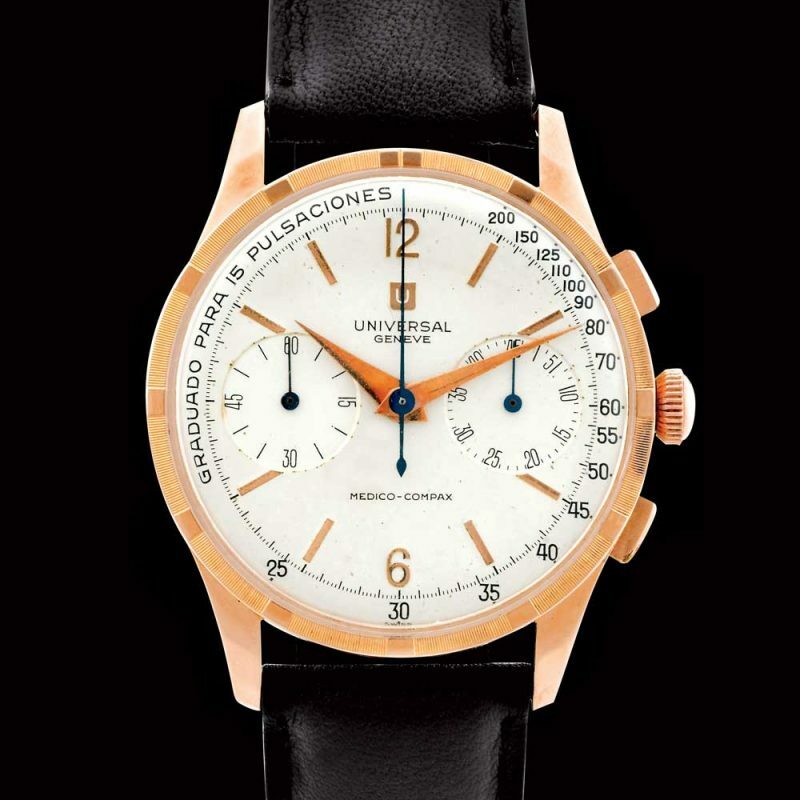 Other world leaders among Universal’s clientele – dictators, alas – included Argentina’s President Juan Perón, who wore a Universal Tri-Compax, and President of the Dominican Republic Hector Trujillo, who owned a pink-gold and enamel Universal Genève. 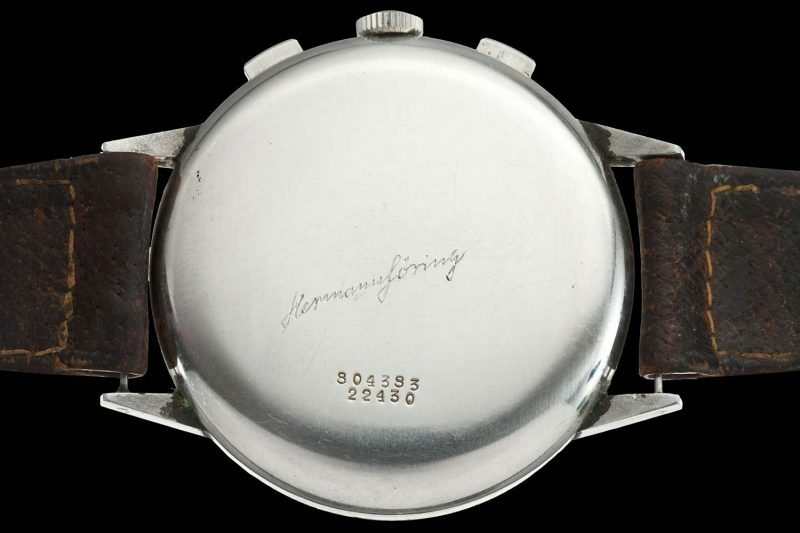 Nazi Reichsmarschall Hermann Göring, apparently a watch enthusiast, gave his Compax to a guard at the Nuremberg Trials, as a gift the night before his scheduled execution. One of the brand’s more morbid anecdotes, it has long been believed by some historians that it was a bribe for a cyanide pill, Göring committing suicide rather than face the hangman. How likely is it? Probably not very – it is believed Nazis were issued with cyanide capsules, which were hidden about their persons. Artists, writer, actors: the watches from Universal Genève found their way to the French writer, poet, filmmaker Jean Cocteau, a celebrated fan of the brand; a limited edition of tourbillons featured verses of his poetry etched on the dial. Jon Voight owned a personalised Compax and Joan Rivers owned a Golden Shadow. 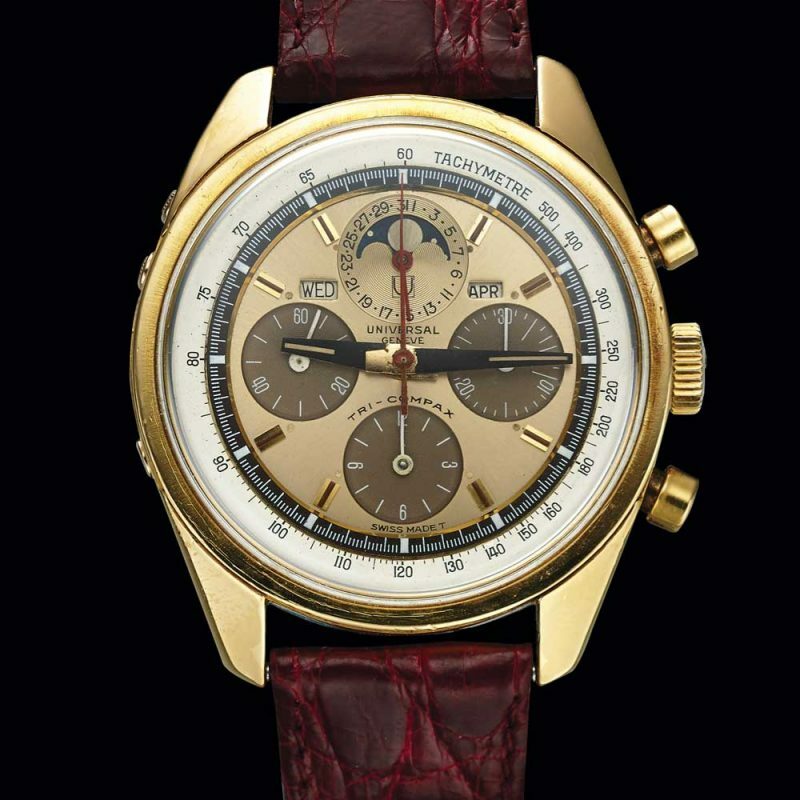 Others to charm investors and collectors include one owned by Eric Clapton, who wore a panda dial Tri-Compax while a member of Cream in the mid-1960s, also visible in photos of his gigs with John Lennon in the Plastic Ono Band. The 1930s Cabriolet was reissued in 1994 to mark the company’s centenary as the Golden Janus, limited to ten pieces. One fetched CHF 43,700 in auction. The most coveted of Universal Genèves must be their model for the Roman retailer A. Cairelli. 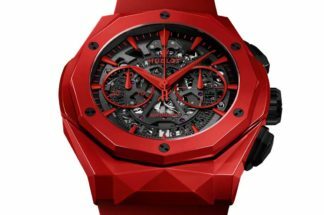 Oversized, it sports a 24-hour dial with a 16-minute register. 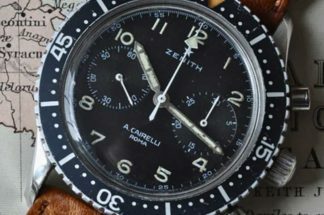 Precious few were produced between 1939 and 1945 for the Royal Italian Air Force and they now command around $100,000.